PHE is involved in many aspects of looking after the health of the public and one of those is preventing and reducing the risk of disasters across the globe. By disasters I mean occurrences like disease epidemics such as Ebola and natural disasters such as tsunamis and typhoons. While we are an England-focused agency, disasters do not recognise borders, and our global work allows us to detect and respond to events that could have implications for the UK. Alongside many other countries, we are committed to the post-2015 development agenda, the agreement made at the UN, on how to address some of the world’s most pressing problems. One of the first ways in which we’ll be delivering this is through the Sendai Framework, which will play a huge role in structuring how we respond and protect people when disasters occur. Named after the city in Japan where the agreements were made early last year, the Sendai Framework provides a much greater level of detail and clarity on the role of risk reduction in disasters and the potential for science and technology to contribute. I wrote a blog last year explaining it in more detail, and now the time has come to implement it. To give the framework more context, it’s useful to use a case study of a disaster where we responded. There is significant experience and expertise across PHE, meaning we have ability to react and work in situations where there are actual or possible public health threats. In the Philippines in 2013, Typhoon Haiyan struck- one of the strongest tropical cyclones ever recorded. It devastated areas of South East Asia, but particularly the Philippines, where it sadly became the deadliest typhoon on record. 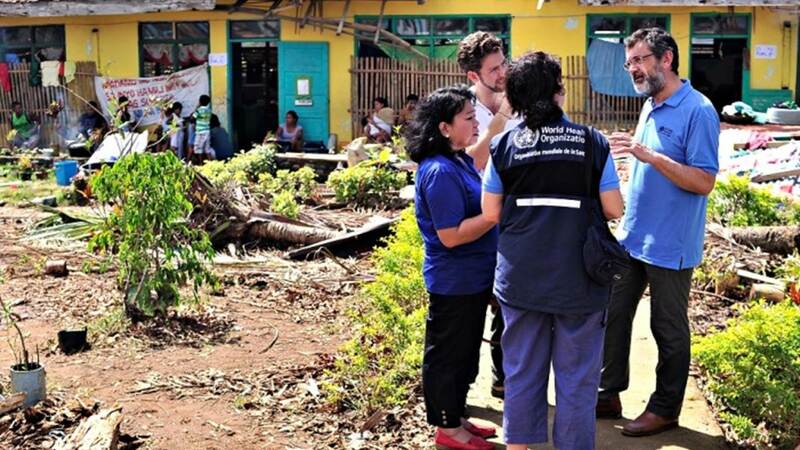 In our response, we mobilised a mixture of short-term senior epidemiologists and infectious disease surveillance and control experts in the immediate aftermath. These experts then worked on developing control plans for the outbreak of infectious diseases (like Dengue fever), identified health facilities and rehabilitation priorities and also developed wide ranging public health development strategies. Since the scale of this particular disaster was so extreme, we were asked to provide further support. This included leadership, logistics and public health recovery planning, which involved deploying a senior consultant for three months. This contribution was hugely valuable and acknowledged for its significance by the World Health Organization (WHO) and the Philippines Public Health Department. When we see disasters such as this, we have to decide if and when is appropriate to respond. It’s vital that countries vulnerable to disasters can build their response systems. We can respond independently, but we can also work alongside other governments and in partnership with organisations like WHO and the Department for International Development (DFID UK). Through having the Sendai Framework, we will be able to build a structured response using a greater level of detail and clarity and consider the potential for science and technology to contribute. The role of health is emphasised within the Framework, with clear messages for Disaster Risk Reduction (DRR) practitioners to recognise health as a key area in ensuring the resilience of communities that may be impacted by a disaster. This global system of shared learning and support will lead to the strengthening of health systems in countries which are most likely to be affected, so they are in a stronger position to be able to deal with disasters. I am chairing the UNISDR Science and Technology Conference which begins in Geneva on 27 January 2016 and will bring together the world’s DRR science and technology communities with the shared aim of developing strategy on the possible ways of implementing science and technology into the Framework until 2030. The team from PHE, which I lead, has a strong focus on building lines of communication within the UK and with international partners and promoting the use of cutting edge science and technology. With over a thousand scientists, policymakers, business people and practitioners attending, this conference offers an opportunity to agree a roadmap that can guide the science and technical communities in our shared pursuit of reducing the risks from disasters and extreme events for this 15 year period. How and when is cancer diagnosed?